It was with devastating news yesterday that the whole world found out that after her heart attack Carrie Fisher died aged 60, drowned in moonlight strangled by her bra. 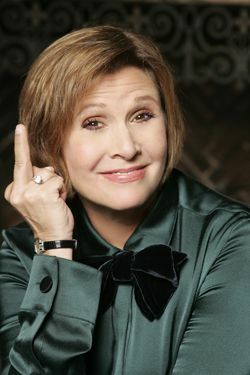 Carrie was, and will still be for a lot of people, Princess Leia. From a low budget science fiction film made, almost, 40 years ago. It is hard to separate the two. The character and the actress has become one. But Carrie was a lot more than just a princess in need of rescuing. Married, for about a year, to Paul Simon and then had a relationship with Bryan Lourd ( until he left her for another man ). She had a daughter with Lourd, Billie Lourd. 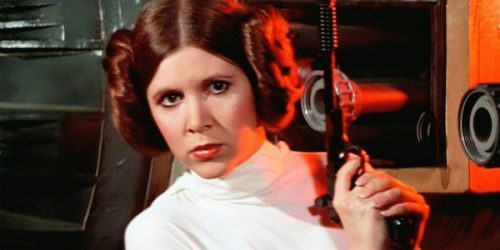 After Star Wars, she never played a character that struck us like she did with Leia. Some of her funniest works were half forgotten. Her characters in The Blues Brothers & When Harry Met Sally… are better than her playing a princess with two buns strapped to her ears. Finally, I leave you with why the start of this obituary has a strange cause of death. This comes from her autobiography, and one woman show, Wishful Drinking. Many other obituaries also carry this, strange, cause of death to honour her wishes. It is also being reported that her mother, Debbie Reynolds has also died aged 84. My thoughts, and prayers, go out to their family & friends. Carrie Francis Fisher, October 21, 1956 – December 27, 2016, drowned in moonlight, strangled by her own bra.